‘This is not the way we do things in NZ’ State Services Commissioner Peter Hughes said as he described connections between government agencies and private agencies at the public release of the ‘Inquiry into the Use of External Security Consultants by Government Agencies’. Hughes sounded truly aggrieved. But the problem is that this is the NZ that many people know. NZ has a long history of both state and private surveillance. For years a wide variety of groups and people have been spied upon, if not by state agencies themselves then by private investigators contracted by the public service. People surveilled include political and environmental activists, Māori and migrant communities, sexual abuse survivors and earthquake survivors - the list is long. Over the years TCIL’s spying has come to light. In 2007 there was news that they infiltrated and spied upon activist groups in Christchurch and Wellington. In Christchurch it was the State Owned Enterprise (SOE) Solid Energy that employed TCIL. In Wellington it was more difficult to find who had employed them, but the groups and people spied upon were Peace Action Wellington and animal rights activists. The then Labour government’s reaction at the time was to condemn the use of spying of State owned Enterprises. But the spying went on and Solid Energy was exposed two years later as still employing TCIL. The Pork Industry Board were also exposed in 2010 as using TCIL, then in 2012 TCIL were noted as being used to spy on Occupy protestors. They published a regular ‘National Extremism newsletter’ that was bought by government agencies such as MBIE and other groups such as the Pig Industry Board and even Massey University. In 2016 TCIL were involved in Protest Karangahake and the TPPA signing. They spied on Greenpeace and set up TOGS: Taranaki Oil and Gas Security Group. And of course, there is their use by Southern Response. But it is not only TCIL that has been employed by state agencies, there are other private investigators used, including Insurance and Commercial Investigations Ltd (ICIL), again a company with former police involved in it. Peter Hughes should be aware of ICIL as he was the CEO of the Ministry of Social Development when ICIL were used to spy on people attempting to sue the Ministry. These were people who had been abused whilst they were children in state care. The ‘White Case’ received minimal press coverage at the time; the reason for the spying was that civil claims had to be stopped otherwise it ‘would have broader application in future claims’. Peter Hughes comments that ‘this is not the way we do it in NZ’ are naïve. This is the way it has been done in NZ for a long time and Peter Hughes and people like him, CEOs and public service management, politicians, and the cult surrounding the NZSIS and GCSB, have enabled a culture of surveillance to dominate. "Mindful of the importance of being useful", GCSB Director Ian Fletcher offered the GCSB's services to Tim Groser. When information about the GCSB spying on Tim Groser´s competitors for the job of Director of the WTO became public in 2015, the general assumption was that this was a case of the government leaning on a supposedly politically neutral agency to advance its agenda. Instead, what the IGIS´s report portraits is an agency taking it onto itself to do some extra-curricular spying in order to be in the good books with the government. The report by Inspector General Cheryl Gwyn is similar to Ian Fletcher´s memory - very specific in some details, but extremely vague in others. It states that it was Ian Fletcher´s idea to approach Tim Groser and offer him some extra spying to help him get the top job at the WTO. The report explains this by Fletcher being "mindful of the importance of being useful", i.e. he wanted to lick Groser´s boots, possibly because there was some public concern about his appointment (he had been appointed by personal recommendation from the PM, somewhat bypassing the usual selection process). Groser agreed that it was a good idea and told Fletcher to go ahead ("expressed his acceptance"). This is where the report becomes fluffy. This "acceptance" is subsequently equated with a ministerial approval, for which Groser - then Minister of Trade - was not authorised. The Minister in charge of the GCSB was the PM John Key. The report is silent on whether Fletcher thought that Groser had the authority to approve the spying or whether he just didn´t care. And because record keeping is not the GCSB´s thing and Fletcher´s memory suddenly stopped working after that meeting with Groser, we will never know. So it looks like Ian Fletcher used the tools of his organisation to buy himself favours with the government, or to express his gratitude for getting a job for which he wasn´t really qualified. That is the essence of it and it shows how easily a spy agency can be used for personal gain. This is why many of us campaigned so hard against giving these agencies more powers. The remainder of Gwyn´s report is interesting, but insignificant. There is some consideration given to the question of whether the spying was in the interest of NZ´s national security, as required by the GCSB Act. Gwyn quotes the law, which allows for spying being done for "economic well-being", but only if it advances national security. But then it turns out that this ominous national security isn´t really defined anywhere: "The lack of a statutory definition gives scope for the government to determine as a matter of policy what its approach to national security will be." In other words, the government is free to declare anything it wants to be a matter of national security. Again, this is what many people pointed out as a real danger when all the anti-terrorism legislation was introduced and the powers of the spy agencies were expanded. Gwyn then refers to the New Zealand National Security System (NSS) framework, which declares "sustaining economic prosperity" to be important for national security. And voilà, Tim Groser becoming head of the WTO is suddenly a matter of national security, because with him in that position, NZ might secure another free trade deal or two. Surprise, the economy is political. The strange thing about the report is that Gwyn clearly describes this circular argument, but then concludes that because it is that way, there is nothing wrong here. Another aspect the reports spends some time on is that of the political neutrality of the GCSB. First it turns out that at the time this concept wasn´t actually part of the law. It was, however, mentioned in both the GCSB´s and the DPMC´s internal manuals. But Gwyn only looks at this issue from a domestic perspective of party politics. She argues that because Groser´s nomination had been supported by both National and Labour, there was no political advantage here for the government. The issue of international politics doesn´t enter here. As Paul Buchanan points out in an interview with RNZ, the issue of NZ spying on allied countries (who put up their own candidates) is at least problematic and should have been considered. And the argument with bi-partsianship for Groser´s candidacy falls short - because it suggest that if Labour had not supported Groser, then the spying would have `arguably´ been illegal. It seems strange to define political neutrality via the absence of an effective opposition. Action alert: On Tuesday, the US Secretary of State, Rex Tillerson is landing in Wellington to meet with the NZ Government. 350 Aotearoa have organised an for him at 12:30 pm at Parliament. If we do want to protect this country from warmongering, one thing to do would be to withdraw from the Five Eyes. As a member of the Five Eyes we are involved in an international intelligence and surveillance network built to meet the needs of US national security. Our membership of the ‘club’ ensures our continual role in war and expansion of the military and surveillance industries. It means we are active in global mass surveillance and social manipulation. Our membership in the Five Eyes means we are following Donald Trump. The week beginning 13 March the Government aims to progress the New Zealand Intelligence and Security Bill. The bill, in fact though, is a complete rewrite of the four Acts and creates a one-stop surveillance shop with one law to rule all. It strengthens and entrenches state surveillance powers by removing any real meaningful distinction between the SIS and GCSB. The distinction between internal and external intelligence is totally blurred. It is worthwhile to remember that over the years many people have protested the expansion of surveillance, including both the SIS and GCSB powers. Between 2009 & 2012 thousands of people protested against the Search and Surveillance Bill. In 2013, John Campbell, on 'Campbell Live’, conducted a poll on the then expansion of GCSB powers - 89% said no to increasing the GCSB powers. The majority of people do not want the expansion of state surveillance powers but are snowed under by the constant law changes and reviews, and the powerful DPMC PR machine. A PR machine that constantly raises the spectre of terrorism and cyber-threat, but they are only spectres - consider the 'Jihadi Brides'. As this Bill goes through, the PR machine will kick in and it has already begun. On Monday 13 March the new Anti-money Laundering & Countering Financing of Terrorism Amendment Bill was introduced by Justice Minister Amy Adams. This combined with Lisa Fong’s report of 'multiple attacks on NZ’s nationally significant organisations’ (whatever they are) will mean the words ’terrorism’ and ‘attacks’ will be in the media. (Lisa Fong is the director of the National Cyber Security Centre (NCSC) for the GCSB). But it is not only the surveillance powers within NZ that are expanding, NZ’s role in the Five Eyes is also further entrenched by the Bill. Rather than heeding what has been uncovered about the Five Eyes over the last few years (thanks primarily to whistle-blowers such as Edward Snowden), the Bill ensures we are supporting the continual growth of the Five Eyes. New Zealand is the fifth member of the Five Eyes and our membership means we are involved in an international intelligence and surveillance network built to meet the needs of US national security (the dominant member of the Five Eyes). Membership of the ‘club’ ensures our continual role in war and expansion of the military and surveillance industries. It means we are active in global mass surveillance and social manipulation. Some people say the Bill will set a better standard for warrants and will improve oversight of intelligence agencies. But for those people who have hope in that, consider just some points in the Bill - it still allows 24 hour warrantless surveillance, the retention of incidental data and doesn't even define national security. The definition of sensitive is anything that “would be likely… to prejudice the security or defence of New Zealand or the international relations of the government of New Zealand”. The government's original plan was to have the Intelligence and Security Bill law passed at the start of this year. It will be happening very soon and it will be a day of great shame. More than 70 people gathered outside Waihopai Spy Base in Blenheim on 28 January. The base has been in operation since the end of the 1980s and from Waihopai NZ hoovers up data to give to the NSA. The NSA have said, the GCSB "continues to be especially helpful in its ability to provide NSA ready access to areas and countries ... difficult for the US to access". From Waihopai NZ spies on China, Japanese/North Korean/Vietnamese/South American diplomatic communications, South Pacific island nations, Pakistan, India, Iran and Antarctica and this data is given to the NSA. Waihopai is the most public emblem of the Five Eyes in this country. It became even more visible after one of the domes was slashed in 2008 exposing the satellite beneath. Later Edward Snowden managed to expose more of the doings of the Five Eyes, Waihopai is not a dirty secret anymore - it is a public shame. 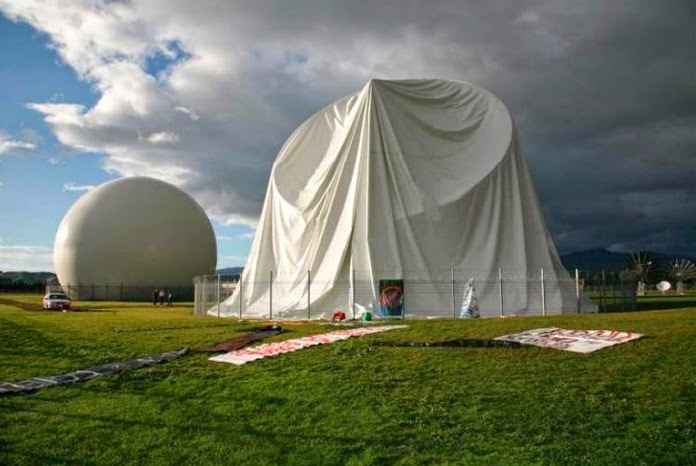 We cannot deny that Waihopai and the operations of the GCSB mean we are part of a global mass surveillance, data collection and social manipulation alliance. An alliance established by the UKUSA Agreement at the end of WW2. The protest outside the base on Saturday 28 January may have been brief but it was followed by a day of workshops in Blenheim where the history of the spybase, the role of the GCSB and campaigning against the base were spoken about. Waihopai spy base must be closed down and we must dismantle the Five Eyes. The annual protest at Waihopai will take place January 28th this year beginning with a morning demonstration at the base and then continuing with a day of workshops in Blenheim, including talks and discussions covering the GCSB and the role of the Five Eyes, research skills and the history of non-violent direct action, including the nearly 30 years of protests against the Waihopai base. With minimal media coverage the submission cycle in response to the NZ Intelligence and Security Bill began last Thursday, more submissions will be heard this coming Thursday (20th October). In 2014 Chris Finlayson described the Select Committee process as 'chit-chat', and for all intents and purpose it appears to be just that. Not all members of the Foreign Affairs, Defence and Trade Committee were present at the first round of submissions on Thursday, 13 October. And as David Small gave his submissions via a Skype call, another member left the room. Others turned pages of paper - possibly they were reading David's submission whilst he was talking, it is hard to know. There has been minimal media coverage of this Bill, there may be a little more coverage after the submissions this coming Thursday. But then there will be quiet again. After the Select Committee hearings close there will be 'in-house' discussions and then the Bill will then be taken back before the Committee of the House before having its third and final reading and being passed into law. There may be a few tweaks and changes here and there but this Bill will then become law sometime after February 2017. Over the years thousands of people have protested and given submissions against the expansion of state intelligence and security laws, but each time the Bills are passed. Some of these Bills passing by only a handful of votes, consider the 2013 GCSB Amendment Bill which was passed by only two votes. The government does not listen to protests nor submissions - so put pressure on the other parties in the House: currently both Labour and the Maori Party support this Bill - tell them not to support it. Submissions on the Bill can be found on the Select Committee page. Submissions are being called on for the new Intelligence and Security Bill – but we say it is time to draw a line in the sand. The unrelenting expansion of the NZ Intelligence Community must be stopped. Since 2007 the NZ SIS Act has been amended a half a dozen times. In 2011 the Video Surveillance Bill became law; a year later the Search and Surveillance Bill was passed. This was followed in 2013 by two changes: the TICS Bill (the Telecommunications Interception Capability and Security) and the GCSB and Related Legislation Amendment Bill, a Bill passed by two votes. At the end of 2014 the Countering Terrorist Fighters Legislation Bill became law. In 2009 there was the Murdoch Report of the SIS, GCSB and EAB. In 2011 Pipitea House was opened enabling most of the NZ intelligence community to operate under one roof and thus uniting the intelligence culture. In 2012 Paul Neazor reported on GCSB spying in relation to the Dotcom saga, this was followed in March 2013 with the Kitteridge Report on the GCSB and then in 2014 the State Sector Review of the intelligence community was released. In 2015 the Cullen and Reddy Intelligence Review began and there was a lot of talk of ‘Jihadi Brides’. Now, in 2016, we have the Security Intelligence Bill, and also the review of the Search and Surveillance Act. As soon as people finish submissions on the Security Intelligence Bill, the next round will begin on the Search and Surveillance Act. We say it is time to say stop the spying. We do not need an expansion of the intelligence communities’ powers. As the UN Rapporteur in May 2016 said, the NZ government had ‘no case for more surveillance’. But the reality is that this Bill will become law. In 2013 many of us wrote submissions and thousands of us took to the streets to oppose the GCSB Bill, and we lost. That law was passed with a two-person majority. We know that, with only be a few token changes to the Security Intelligence Bill, this new law will be passed, too. The reality is that unless the opposition parties vote against it, the Bill will be passed. Submissions may result in a few changes in the Bill but the key aims of the Bill will be passed: the Bill will bring the Security Intelligence Service (SIS) and Government Communications Security Bureau (GCSB) under one unifying law and remove all restrictions against the GCSB spying on New Zealanders. You may choose to write a submission on the Bill, but also call upon the parties in opposition to oppose the Bill. Currently, both the Labour Party and Māori Party support it. Contact them and tell them not to support the Bill – rather than engaging in debate with the government about the 107 recommendations of the review, what is needed is debate on surveillance and its role in society. The Search and Surveillance Act 2012 is to be reviewed. The Search and Surveillance Act is to be reviewed and a one-stop intelligence shop could come closer to realisation. Number 4 of the terms of references for the review is that it must look at whether the Act (or any related legislation) needs to be amended to enable broader use of the capabilities of the GCSB and /or NZSIS to support police investigations. This would tie in nicely with the recommendations by Michael Cullen and Helen Reddy in their ‘Intelligence Review’ that the intelligence community operate under one Act, that is, in all but name there be a merge of the intelligence agencies. Implicit in Amy Adams announcing of the review however, is that the agencies and institutions covered by the Act need more powers. Amy Adams (Minister of Justice and member of the Intelligence and Security Committee) states in her press release that technology has changed and therefore the powers of the Search and Surveillance Act need to also change. What Amy did not cover in her press release though was the fact that the terms of reference also state that the review must look at the use of the Act (or any related legislation) in relation to the GCSB and /or NZSIS. The Search and Surveillance Act has been around since it was passed in March 2012 by a narrow majority. But the Bill took a long time to weave its way through parliament - it was introduced first by Labour in 2007 before finally being passed by National. Throughout that time there were wide-spread protests against its passing; the Act drastically extended the powers of not only police but many state agencies to spy and surveil. They gained more power to do unwarranted searches and surveillances. The Act also legalised past police practice that had been illegal, including the police illegal use of hidden cameras during Operation 8 (the operation that resulted in the October 15th 2007 police raids and the jailing of Tame Iti and Te Rangikaiwhiria Kemara for two and a half years). The Act also removed the right to silence and the right not to self-incriminate through the introduction of Examination and Production Orders. When the Bill was going through parliament (there were two rounds of submissions), many people protested and spoke against a ‘Residual Warrant’ clause in the Bill. Residual Warrants were to cover as yet uninvented, unknown things - for example, it could use a technique not yet invented to surveil data stored in a way not yet known. Residual Warrants were removed in its final reading and replaced by ‘Declaratory Orders’ (clauses 65-69). At the time Judith Collins, then Minister of Justice, described Declaratory Orders as “an innovative regime that recognises the pace at which technology is advancing … Declaratory orders allow agencies to obtain a judicial view as to the reasonableness of a new device, technique, or procedure before using it…” Maybe Amy and Judith need to talk. An overview of the Act can be read here. Public submissions will be called for and along with consulting various government and private sector agencies and organisations there will also be an expert advisory panel. The brand new Auckland University Law School’s ICT Law Centre is assumed to be one of these ‘experts’. The Law Commission and Ministry of Justice will present the final report on or by 28 June 2017. New Zealand is very much a member of a western spy network that is quite capable of reading and recording every shred of electronic communication you've ever generated. 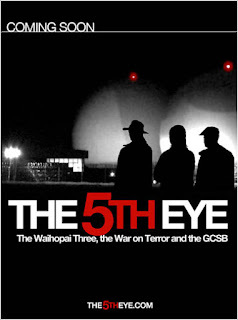 The long anticipated documentary, THE 5TH EYE, that follows the story of the Waihopai Three and the GCSB premieres this month in the New Zealand International Film Festival. The film will screen as part of the festival in Wellington, Auckland, Christchurch, Dunedin and Timaru. Other regional screenings will be announced by the Film Festival in coming weeks. Details about ticket sales are at www.The5thEye.com – Please be sure to get tickets early. We also need your help: word of mouth and social media are currently our only promotional tools. So please join our facebook page, follow us on twitter, and please share our posts, tell your friends about the film and forward this email around to your contacts! Thanks and we look forward to seeing you at the upcoming screenings!